"Get away from the world for a while"
Property 54: "Get away from the world for a while"
Property 58: Westbury Cottage B&B clean neat great location! Property 61: Corktree Cottage - Gorgeous cosy accommodation in the beautiful Adelaide Hills. 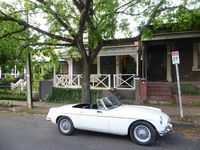 Property 62: Your comfortable home away from home in the East End of the Adelaide CBD.